Rich, fragrant and zesty with a mild heat, bring a perfect touch of Thai cuisine to your menu with a wonderfully creamy Panang curry. Our Creative Cook blend works beautifully with chicken and just as well with beef or pork. For that real Thai touch, garnish with crushed roasted peanuts and wedges of zesty lime. Richer, sweeter and creamier than the more fragrant Thai red or green curries. 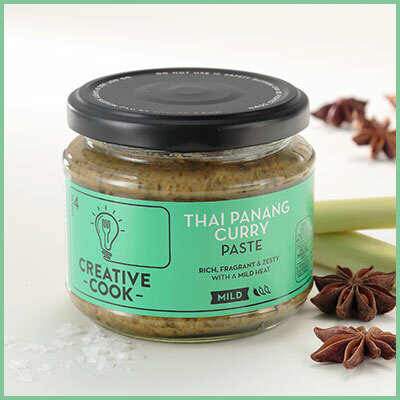 Packed with sweet coconut and fragrant ginger and lemongrass, our Thai Panang paste helps you create a delicious curry in minutes.